A while back, Gamefly announced that they'd be getting into the game publishing business. Writer Rumble is the first game out of the gate and it turns out to be a surprisingly fun affair. You get to pick from six influential scribes—Edgar Allen Poe, Agatha Christie, the Brothers Grimm, Jane Austen, Homer or H.P. Lovecraft—who throw words around like Street Fighter's Guile throws sonic booms. 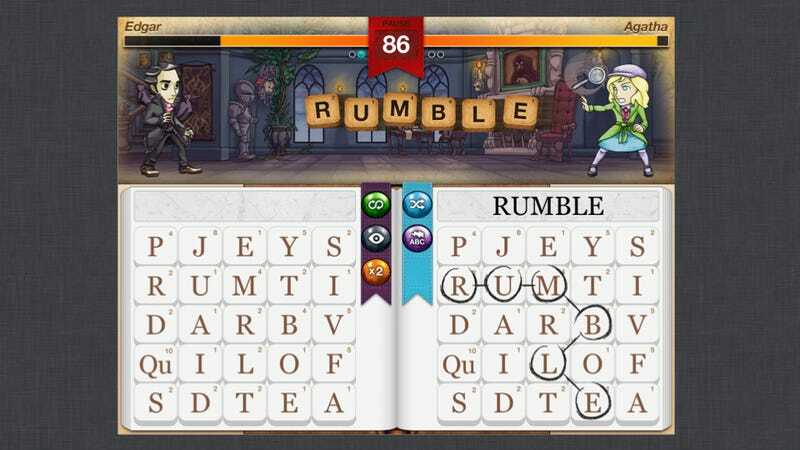 Players get a grid of jumbled letters to form words from and the words they make launch attacks against either human or monster opponents. A variety of special powers can be equipped for each character, letting them double the damage of words or shuffle up a new pool of letters to draw from. The solo Survival Mode generates a nicely frantic pace to smacking down monsters as quick as you can. I've only been able to play local multiplayer but the vs. mode does feel a bit like a fighting game for word nerds. Not a bad nybrid to be, if you ask me. Part of Writer Rumble's charm comes from its visual interpretations of the author characters. Poe has two raven sidekicks called Never and Moore and Lovecraft battles alongside a hulking cartoon Cthulhu. You want to make these guys badasses, despite the fact that seems to be a word that doesn't get recognized by the in-game dictionary. The game goes live in the App Store today. If you wind up getting it, it'll give new meaning to the phrase "strong vocabulary".